Did The Media Blatantly Mischaracterize Video Of Newtown Father Being 'Heckled' By 'Gun Nuts'? Did The Media Blatantly Mischaracterize Video Of Newtown Father Being ‘Heckled’ By ‘Gun Nuts’? Did Media Mislead On Video Of Newtown Father Being 'Heckled' By 'Gun Nuts'? 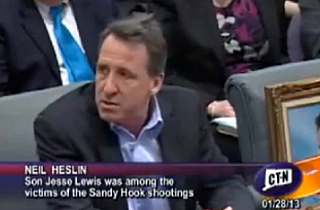 Controversy has erupted over whether media outlets have misled with selectively edited footage of gun advocates “heckling” the father of a Sandy Hook victim as he testified before the Connecticut legislature. A few members of the audience saw this as a moment to respond, shouting things like “the Second Amendment shall not be infringed,” which prompted a legislative official to reiterate the rule of no interruptions during testimony. Bashir’s version of the “heckling” footage is clearly missing the part where Heslin challenges whether anyone in the room can explain why civilians would need “assault-style weapons.” Also missing: the father’s follow-up with dramatic pause and “Not one person can answer the question.” Instead, we see a jump-cut immediately to the “hecklers” with Heslin looking over his shoulder to see who spoke up. Blogs like Raw Story and Gawker wrote up the story in a similar manner, characterizing the incident as “angry” gun advocates “heckling” the grieving father, without mentioning what some might see as the important context explaining why the attendees might have felt it an opportune moment to shout a response. Huffington Post, Slate (which characterized the advocates as “sickos“), and The Daily Beast all followed suit. But when the video with full context made the rounds on the web, the questions became: Did MSNBC selectively edit the incident to make it seem like Heslin was being shouted down by a group of “gun nuts”? And was the print/web media complicit in mischaracterizing the incident as “angry” mob-like “heckling”? From this video, it appears Twitchy has a point. Heslin posed a question to the audience and paused. The gun advocates in the room clearly withheld responding until after he declared that no one was able to answer him. And upon their shouting of “the Second Amendment” as the reason they should be able to possess “assault weapons,” Heslin was remarkably civil — as was the crowd, which quieted down almost immediately. It’s certainly worth pointing out that the audience members aren’t supposed to interrupt a witness—a lawmaker running the hearing can be heard asking for the crowd to be quiet—and it’s possible that Heslin’s question was a rhetorical one, and his pause was simply for dramatic effect. But regardless, it also appears as though those gun-rights advocates who spoke up were doing so in response to what they heard as a question. Even if such actions represent an interruption they nonetheless appear to fall well short of heckling, an act that most often comes with an air of harassment associated with it. The full video caused others to rethink their characterizations. CNN’s Anderson Cooper initially tweeted that Heslin was “shouted down,” but then deleted the tweet after conservative firebrand Michelle Malkin went after him. But so far, those are the only major media outlets to reverse their stance on the “heckling.” Aside from Slate, none of the aforementioned blogs have addressed the “context” problem. David Frum accused his critics of “condoning” the heckling of a grieving father, rather than tackle the question of whether it was heckling in the first place. He took to his show Tuesday night to air the full clip and explain that he believes Mr. Heslin was heckled not by using the literal definition of the word to claim their actions might constitute “heckling,” but by saying it was absolutely “heckling” because Heslin’s question was not sufficiently answered. Sure, some may find the audience’s response distasteful given Heslin’s tragic circumstances, and the fact that the legislature has specific rules about interruptions. But was this “heckling”? No. Reasonable liberals can find the gun advocates’ answers to be simplistic or unproductive, but it is disingenuous to ignore the fact that they were simply answering his question, not bullying him or shouting him down. Indeed, it appears as though the media outlets who mischaracterized this incident as all-out “heckling” did so simply because they disagree with what the people were saying and to whom they were saying it. You’d think established reporters would know the difference.